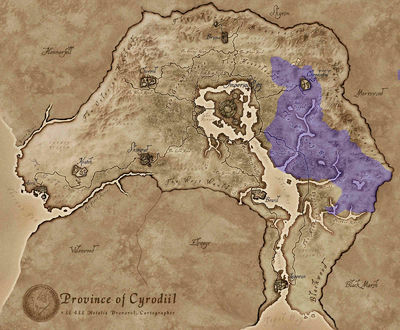 The Nibenay Basin is a region in eastern Cyrodiil. The northern part of the region encompasses the city of Cheydinhal. To the east, it shares a border with the Valus Mountains region. To the west, the region is bounded almost entirely by the Heartlands except for a small area in the north that lies next to the Great Forest. The area stretches south as far as the Panther River. The eastern portion of its southern edge abuts Black Marsh, while the western portion meets the Nibenay Valley and the southern portion borders Blackwood. The Blue Road enters into the region from the west, and the Yellow Road enters from the west and exits to the south. The region is surprisingly sparsely-vegetated. The south holds abundant Summer Bolete mushrooms and Foxgloves but only Lavender, Monkshood and Bergamot grow much elsewhere. There is also a sprinkling of other plants including Lady's Smock, Ginseng, Flax, Columbine, Alkanet, Motherwort, Peony and Primroses plus a few Nirnroot growing along the banks of the region's many rivers. A list of places that can be found within the Nibenay Basin region. The Blue Road — Main road from the Imperial City to Cheydinhal. The Yellow Road — Eastern road from the Imperial City to Leyawiin. 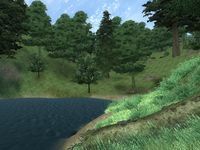 Corbolo River — A river in eastern Cyrodiil that drains the northern Valus Mountains into the northeastern Niben Bay. Lake Canulus — A lake to the east of the Silverfish River. Lake Poppad — A lake north of the source of the Corbolo River. Panther River — A river that snakes through the Nibenay Basin east of Bravil. Reed River — A short, northeastern tributary of the Corbolo River. Silverfish River — A river that flows down from the Valus Mountains into Niben Bay. A list of all quests involving the Nibenay Basin region. Cheydinhal Recommendation: Recover a lost ring to obtain a recommendation from Cheydinhal. Affairs of a Wizard: The first Dead Drop contract at Hero Hill, to stop a necromancer from achieving immortality. A Brush with Death: Help a distraught wife find a famous painter who has gone missing. Lich of Lost Boy Cavern: Follow the story of an exiled mage trying to save his friend from himself (non-journal). This page was last modified on 7 October 2018, at 18:59.